I'm pretty sure I've already made the Hex Hall meets Sky High comparison, but I can't not bring it up again. This is the kind of comparison which should be perceived as a good one, though. 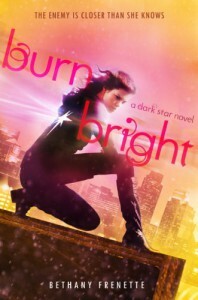 Burn Bright followed a promising (yet shaky) first book and amped up the danger, adventure, and (somewhat) forbidden attraction. "You just told us the world is ending. I'd like to know how much time I have to prevent it." "Our first date is not going to include hospitals, Harrowers, apocalyptic predictions, or my mother." But it's not a confused genre thing which has me liking what's going on. And it's certainly not the hodgepodge of different character traits and plot points that I've seen in other, popular series, because these books are not working with the freshest ideas or most unique story. This is simply all about the fact that an author came along and decided to bring the fun and adventure and romance - and it all came in a smartly written package. I have absolutely no notes in my book copy about stupid decision making or awkward social skills. Imagine that. Leon was willing to die for me. It was the sort of thing that sounded romantic in theory; the type of wild, passionate declaration you hear in movies. But this wasn't a vow. It wasn't a promise. It was a fact. Cold, hard, inescapable. And it didn't feel romantic. It felt terrifying. A female lead who gets it? Who knew? Moms with young teen daughters might enjoy the experience of reading the Dark Star books together. The emphasis on family and loyalty is a positive message set in a story which doesn't feel preachy or disingenuous. This would be a cute little movie franchise. Go, Disney, go. Book provided from publisher in exchange for an honest review. All quotes taken from the pre-published copy and may be altered or omitted from the final version.